The Clean Water Program is hosting a public meeting on October 2 to provide information about and receive public input on potential impacts to the environment related to the Underground Flow Equalization System project (formerly called the In-System Storage Facility). This project is part of the city’s 10-year program to improve and repair the aging sewer collection and treatment system. During storms, rainwater enters the sewer system through cracks and other defects. The amount of rainwater can overwhelm the sewer system capacity, resulting in overflows at the wastewater treatment plant and at locations around the city, such as manholes. These overflows contain a mixture of rainwater and untreated sewage. They are a danger to human health and the environment because they contaminate streets, creeks, lagoons, beaches and the San Francisco Bay. 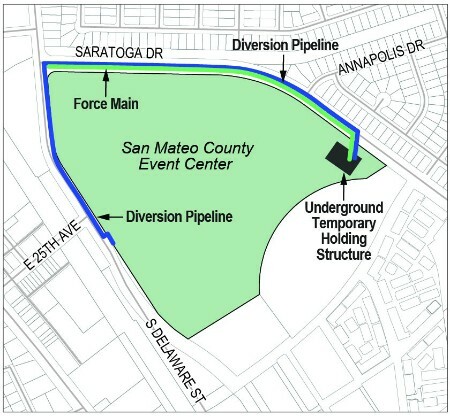 The approximately 5-million-gallon underground holding structure is proposed to be located in the eastern portion of the San Mateo County Event Center parking lot. This location was selected by the City Council in 2017, after a lengthy series of public meetings and hearings. When the sewer system becomes overwhelmed during heavy rains, it will serve as a temporary holding area for the mixture of rainwater and sewage. This temporary storage will generally be for 24 hours or less, until the storm passes. This will allow the wastewater treatment plant to “catch up” with the high flows. Once the wastewater is released to the treatment plant, mechanisms to flush and clean the structure will activate. The structure will also include advanced odor control features, such as air-tight vaults and carbon filters. The design of the project is sixty percent complete, and more details about construction schedule and cost will be released when they are available. To comply with the California Environmental Quality Act, the city is preparing an Environmental Impact Report (EIR). The city is seeking public input on how the proposed project may affect the environment. The meeting is one way for the public to learn more about the Underground Flow Equalization System project and provide input that the city will consider during preparation of the EIR. Comments must be submitted by October 22, 2018. Want to learn more about your sewer rates and how they are calculated? New sewer rates effective 2018 - 2019 have been posted on the City's website. Please click here to view. The City's sewer charge administrative regulations, which detail how sewer rates are charged for different user classes are also accessible at the link above. As part of the Clean Water Program, approximately 2,000 feet of existing sewer pipes along Shasta and Glendora drives are being replaced and upgraded. 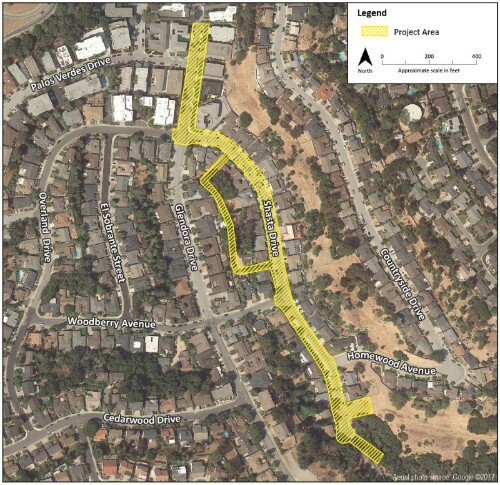 This project will replace portions of the sewer pipes in City easements in Shasta Drive residents' backyards or side yards with a new, larger pipe in the street. Improvements on Glendora Drive will occur in the street. Construction is expected to continue through November 2018. Residents will be receiving additional notices about upcoming work, as well as vehicle access and parking during re-paving. Applications for fiscal year 2018-19 are now available. This program is very popular, and funding is limited. We encourage you to apply early.